Concentration is a great card game that is a lot of fun and can improve your memory. Although there are special card games you can get for variations of the game, all you need to play concentration is a standard 52 card deck. Concentration can be a good game to play with students of varying ages as young students can often compete with older students. A match is when two cards have the same rank and color. For example, a match would be two Jacks that were both red, one was the Jack of Diamonds and the other the Jack of Hearts. To make the game easier, allow matches of any rank where color doesn't matter. You can play concentration by yourself and then time yourself to try and complete the game faster than before. Or you can try to finish the game in fewer and fewer turns. Stop each turn after only one flip of the cards. Make it so that pairs need to be the opposite color rather than the same color. Play with two decks where matches have to be of the same suit and the same rank. 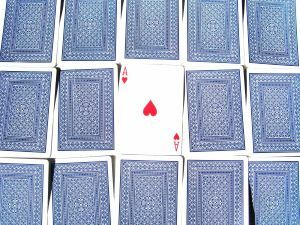 For example, the nine of hearts only matches with the other nine of hearts. Double Deck Dual Concentration - In this version each player has their own deck. During a turn, player one flips a card from his deck, player two then flips a card from her deck and tries to match it. Then the roles reverse on the next turn. One good strategy to use with Concentration is not to always turn over the card you are sure of first. For example, if you know exactly where one 2 of Hearts is, but only think you know where the 2nd one is, turn over the guess first. This way if you are wrong, you can then pick a random card and have a chance of getting a match.